Canada is the largest energy trading partner of the United States, based on the combined value of energy exports and imports. 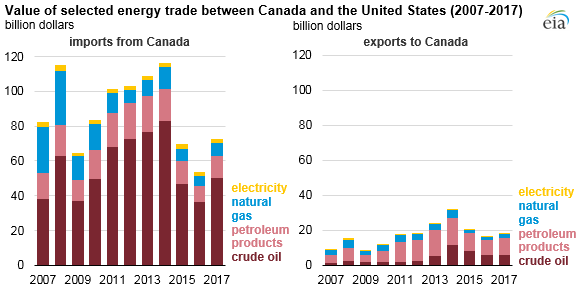 Although the value of bilateral energy trade with Canada has varied over the past decade, driven primarily by changes in the prices of oil and natural gas, the overall structure of bilateral energy trade flows has changed relatively little, with the value of U.S. energy imports from Canada consistently exceeding the value of U.S. energy exports to Canada by a large margin. Increasing energy commodity prices in 2017 led to growth in the value of both exports to and imports from Canada. Based on the latest annual data from the U.S. Census Bureau, energy accounted for $18 billion, or about 6%, of the value of all U.S. exports to Canada. Energy accounted for $73 billion, or about 24%, of the value of all U.S. imports from Canada in 2017, up from 19% in 2016. Canada is the main source of U.S. energy imports and the second-largest destination for U.S. energy exports behind only Mexico. Crude oil accounts for most U.S. energy imports from Canada, averaging 3.4 million barrels per day (b/d) in 2017. Canada is the largest source of U.S. crude oil imports, providing 43% of total U.S. crude oil imports in 2017. The value of U.S. crude oil imports depends on both volume and price. In 2017, the value of U.S. imports of Canadian crude oil increased, reaching $50 billion, as a result of both an increase in oil prices and an increase in volume. Canadian crude oil imported by the United States is largely produced in Alberta and consists mainly of heavy grades shipped primarily to the Midwest and Gulf Coast regions. Until the removal of restrictions on exporting U.S. crude oil in December 2015, virtually all U.S. crude oil exports went to Canada. 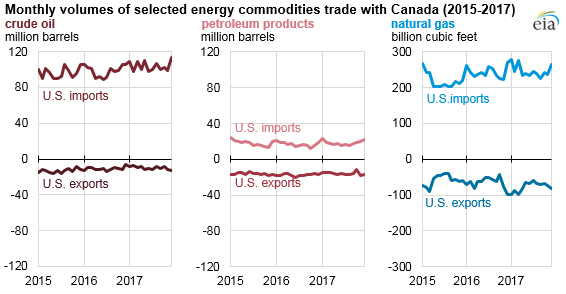 Since the United States began exporting more crude oil to other countries, Canada’s share of U.S. crude oil exports has fallen, although Canada still remains the largest destination for U.S. crude oil exports. In 2017, for the first time, the United States exported more crude oil, in total, to other countries (794,000 b/d) than it exported to Canada (324,000 b/d). U.S. crude oil exports to Canada are typically light sweet grades that are shipped to the eastern part of the country. Bilateral petroleum products trade with Canada is relatively balanced in both volumetric and value terms. In 2017, Canada was the destination for 516,000 b/d of petroleum products, or 10% of all petroleum products exported from the United States. These exports were valued at more than $9 billion in 2017. However, the mix of petroleum product flows between the United States and Canada varies by product and region. For example, the United States is a net importer of gasoline from Canada, with significant volumes flowing from refineries in Eastern Canada to serve markets in the Northeast United States. In contrast, very little of the petroleum products exported from the United States to Canada are finished transportation fuels. Pentanes plus, liquefied petroleum gases, and other oils constitute most U.S. product exports to Canada. Some of these products are used as a diluent to enable pipeline movement of heavy crude oils produced in Canada. Overall, U.S. petroleum product exports to Canada and other destinations have increased over the past decade. Bilateral natural gas trade between Canada and the United States is dominated by pipeline shipments. Natural gas imports from Canada increased to 8.1 billion cubic feet per day (Bcf/d) in 2017, accounting for 97% of all U.S. natural gas imports. Total natural gas imports from Canada were valued at $7.3 billion in 2017. Most of Canada’s natural gas exports to the United States originate in Western Canada and are shipped to U.S. markets in the West and Midwest. 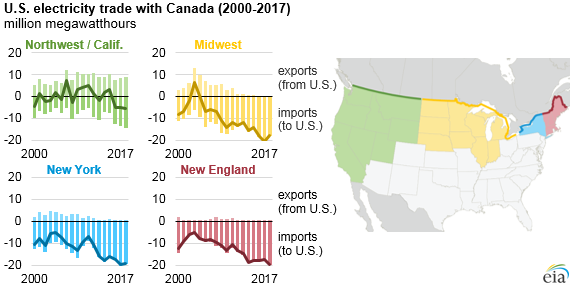 U.S. natural gas exports to Canada, which increased to 2.5 Bcf/d in 2017, mainly go from New York into the eastern provinces. Increases in pipeline capacity to carry natural gas out of the Marcellus and Utica shale formations increased flows of U.S. natural gas into Canada, reducing pipeline imports from Canada and increasing U.S. pipeline exports to Canada. Electricity accounts for a small but locally important share of bilateral trade. In 2017, the value of U.S. imports of electricity from Canada increased for the second straight year, reaching $2.3 billion. The United States imported 72 million megawatthours of electricity from Canada in 2017 and exported 9.9 million megawatthours, based on data from Canada’s National Energy Board.